I witnessed a lot of creepy stuff during my time as a reporter. Like a roomful of dismembered hands. OK, so they weren’t REAL dismembered hands. 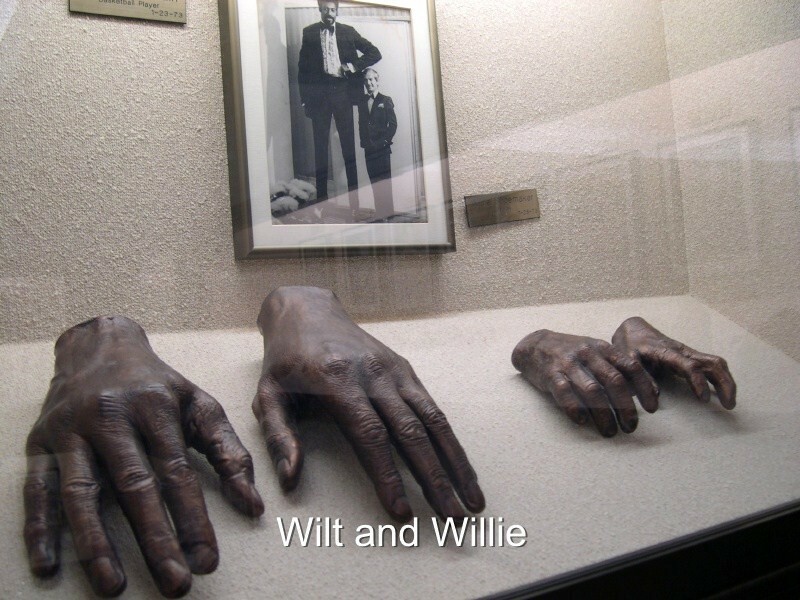 They were bronzes of famous hands cast by Dr. Adrian E. Flatt at Baylor University Medical Center. Dr. Flatt was a renowned Dallas hand surgeon, so he had good reason for creating his collection. It struck me as *way creepy. I happened upon the creepy-yet-oddly-compelling Flatt Hand Collection in 1986 when I was freelancing. Dr. Flatt was kind enough to give me a guided tour of the collection. He opened up display cases so I could compare my right hand to the right hands of famous people, under eerie-greenish fluorescent lighting. o Even for a hand surgeon, liking hands this much just seems wrong. (Sorry Dr. Flatt, I call them like I see them). o Watching the actual casting process, which involved latex as I recall, did not make it seem any less wrong. 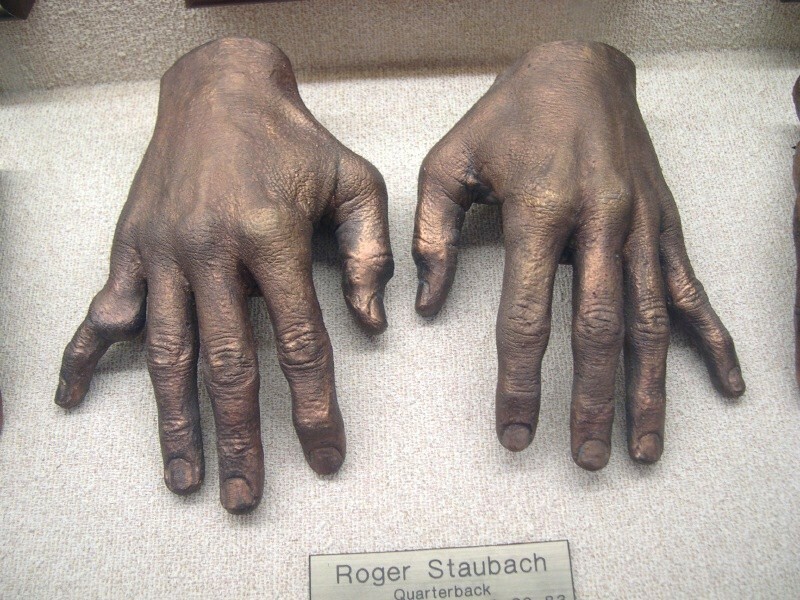 o Dallas Cowboys Quarterback Roger Staubach had a monster little finger knuckle on his throwing hand caused by having it smashed so often by All-Pro defenders. o My wee hand is about the size of legendary jockey Willie Shoemaker’s. His battered hands are featured right next to those of basketball great Wilt Chamberlain. You can imagine how insignificant I felt in 1979 when I shook Wilt’s hand and it totally swallowed mine. o But all of this paled to insignificance when I came to the “cinder block size” maws of André the Giant. I mean, this is the age of 350-pound offensive linemen and 400-pound Wal-Mart shoppers, so you probably think you understand the concept of “big mutha”. But trust me, you do not. That is unless you were part of the adoring, and totally mental, crowd at Westlemania III. This epic sporting event — which was only slightly less hyped than every Super Bowl ever played AND the landing on the moon — matched Hulk Hogan (6-7 320 pounds) against André the Giant (6-10, 520 pounds). Far be it from me to say that the match was totally rigged. That André actually pinned the Hulkster early in the match, but the blind and almost certainly corrupt ref missed it. 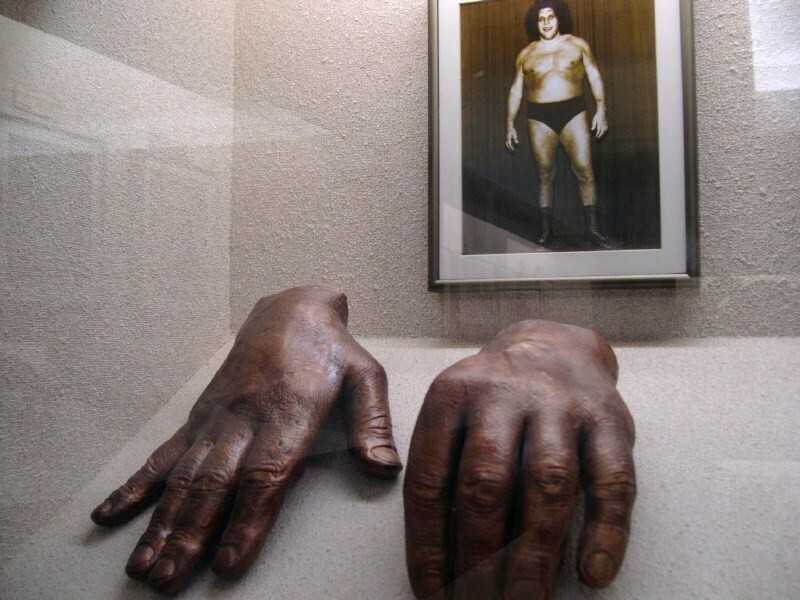 That at one point André shoved his massive cinder block-sized right hand into the Hulkster’s skin-tight gold shorts and proceeded to carry him around the ring like a golden suitcase. Now THAT was entertainment, and not at all creepy in a hand-related way. Click here for OkieBoomer memories; more nostalgia than creepy. Trust, me.